Tim Duggan Books, 9781524760069, 416pp. India is the world’s largest democracy, with more than one billion people and an economy expanding faster than China’s. But the rewards of this growth have been far from evenly shared, and the country’s top 1% now own nearly 60% of its wealth. In megacities like Mumbai, where half the population live in slums, the extraordinary riches of India’s new dynasties echo the Vanderbilts and Rockefellers of America's Gilded Age, funneling profits from huge conglomerates into lifestyles of conspicuous consumption. 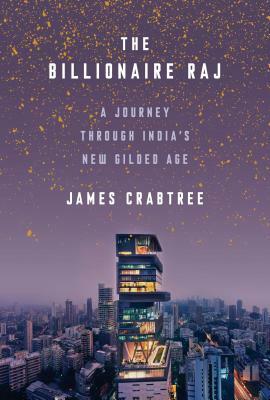 James Crabtree’s The Billionaire Raj takes readers on a personal journey to meet these reclusive billionaires, fugitive tycoons, and shadowy political power brokers. From the sky terrace of the world’s most expensive home to impoverished villages and mass political rallies, Crabtree dramatizes the battle between crony capitalists and economic reformers, revealing a tense struggle between equality and privilege playing out against a combustible backdrop of aspiration, class, and caste. The Billionaire Raj is a vivid account of a divided society on the cusp of transformation—and a struggle that will shape not just India’s future, but the world’s. James Crabtree is an associate professor of practice at the Lee Kuan Yew School of Public Policy at the National University of Singapore. He was formerly the Mumbai bureau chief for the Financial Times.